- Are the spaces at both corners wasted ? Can we use Lazy Susan? I have similar situation here, but if I place my dishwasher next to my sink, I was told that I can't use lazy Susan in my case. And another problem is that sink will not be centered. Will that look odd ? ( Your window is in the center of the sink ) Thank you. 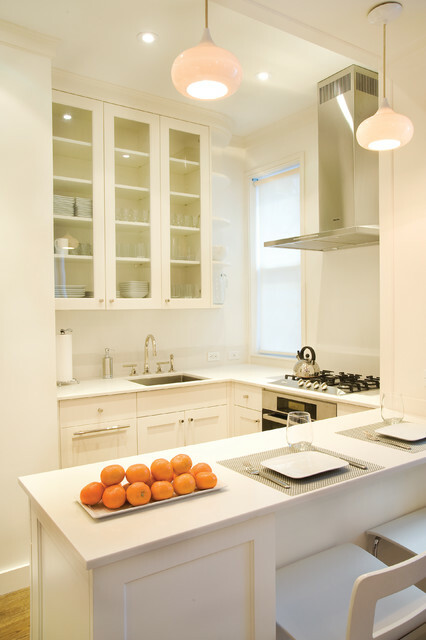 - What is the counter top material? Are there any other views of this space? 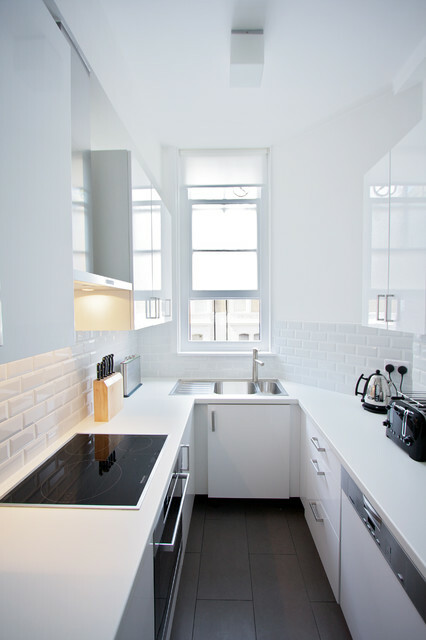 What are the dimensions of the area of the kitchen in the photo? Thanks!! 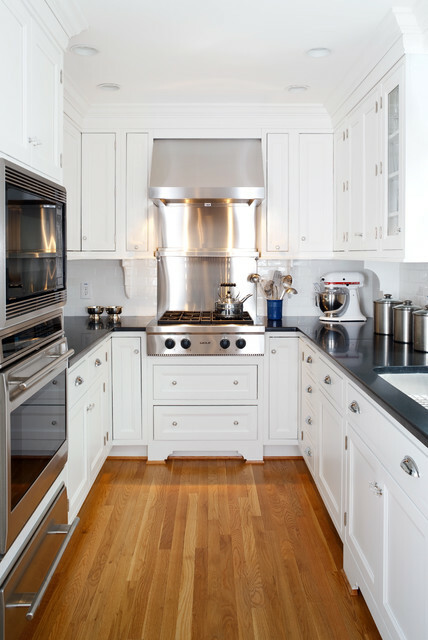 what is the size of your range hood? Where are the cabinets from? Mr. Kelley, you don't like this kitchen and know nothing about it. Why then are you responding at all if you only offer the fact that you dislike the kitchen and you are only the photographer. It really is annoying. When he said that he's not "keen on" the design, I don't think he meant that he doesn't like the design, only that he doesn't have knowledge of the design. 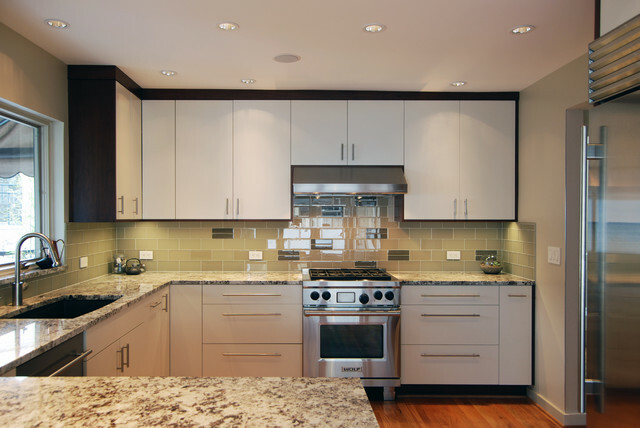 Who makes the range hood shown in this kitchen? - Any other product info? Hi, unfortunately I am the photographer and am not keen on the design details of this space. Sorry I can't be of more help. 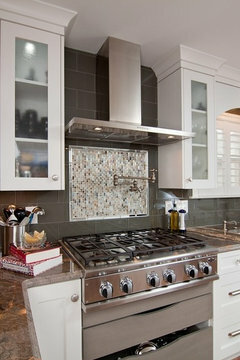 Where did you end the tile backsplash by the range hood? - We have cabinets that don't go all the way to the top so I don't know where to end the backsplash. I was planning to take it all the way up the top but am afraid that will look strange. Thanks for any guidance. 1.) 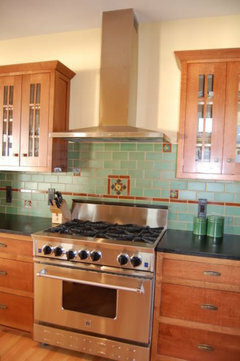 Run the backsplash up to the hood, and leave the rest of the wall with flat painted color (attached example on the right). 2.) 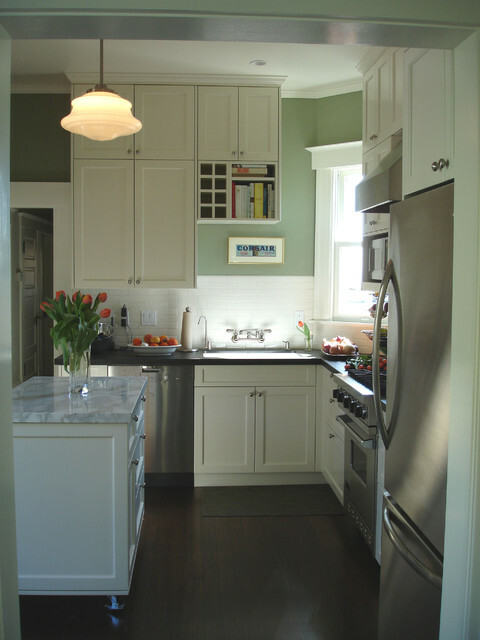 Run the backsplash up to the top of the cabinets, and have a contrasting or matching color "strip" above. 3.) Run the backsplash all the way up to the ceiling. 4.) 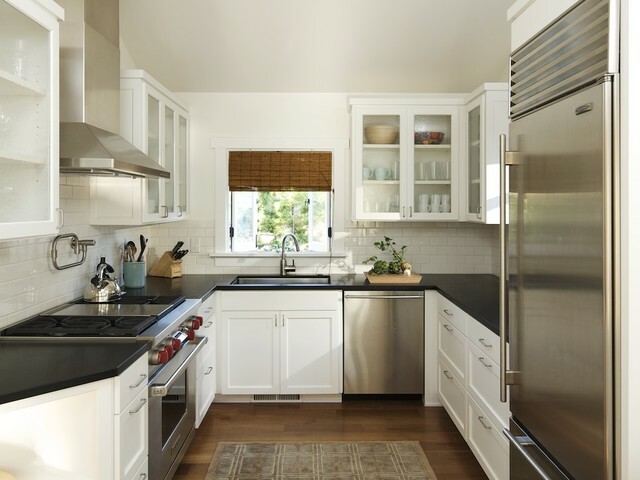 Fill in the entire space with backsplash, but make the area between the hood and the cooktop stand out with a different color/pattern/texture (attached example on the left). This is not a small kitchen! I wouldn't exactly call it big, either! You are right, not big but also not small! Is a good size kitchen and I quite like it! love it..what is the dimensions of the room?? Not sure - I'm just the photographer! I'd venture a guess and say about 9 feet wide and 10-11 feet from the camera to the window. I am NOT a photographer ! What is the counter top material? Thanks. Wish I could help - I am just the photographer, not the designer! Sorry! 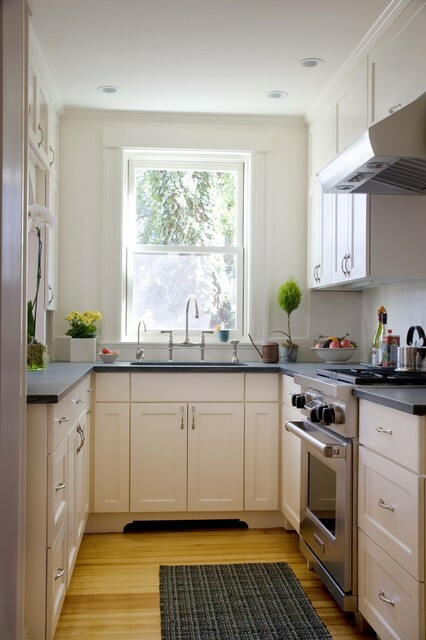 - Are there any additional images of this kitchen space? What is the hardware brand? Love the subway tile! Exactly what I'm looking for. Can you share the size/material and who makes it? Sorry, I am only the photography and not the designer so I'm not 100% on that information. Sorry, I am just the photographer and didn't do any of the design! Unfortunately I can't help with that one as I was only hired by the interior designer to shoot the space. Sorry!! love the cabinets-can you please tell me who makes them? - I need to know what type of counter top this is; also where to get it. I am not sure - I am only the photographer and not very knowledgable about the counter tops here. - Can you tell me the dimensions (width &amp; length) of the floor space in the middle? 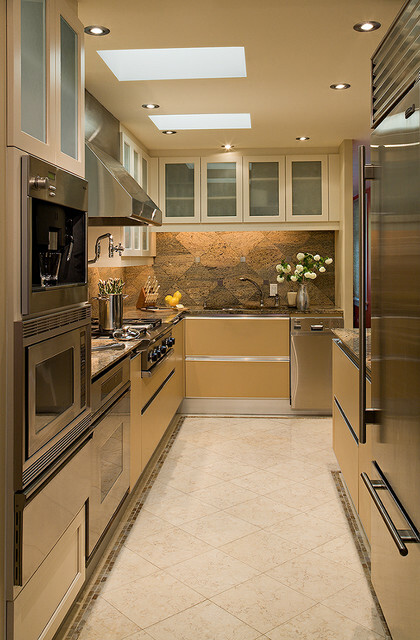 Love this kitchen; almost resembles what I am planning for my own....thanks! Based on the cabinets, that's 36" + standard dishwasher @ 30" so probably about 66". - I can't see any lights (recessed or otherwise) in this image. 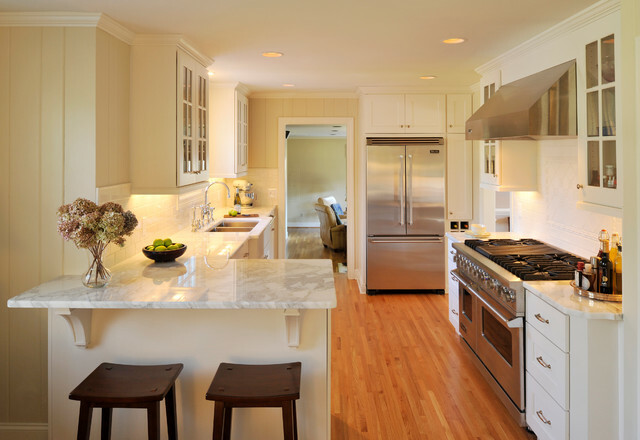 Do you have another image that shows more details of the lighting in this kitchen? What window brand and style is this? And is there a screen? - What are the dimensions of this room? Cons of a Closed LayoutOf course, a closed-off kitchen’s isolation also can be its main downfall. 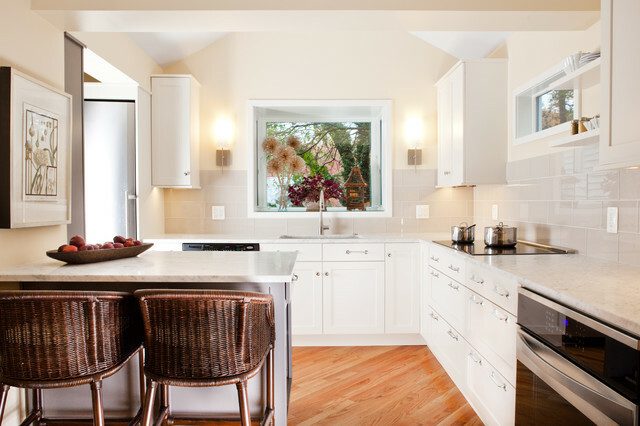 This layout doesn’t allow for direct access from the kitchen to the dining table, or vice versa. And it’s difficult to interact with friends and family while whipping up meals, since most of the room is reserved for the work triangle.